Its obvious that the Yankees need to make some moves in order to contend for the playoffs. They are not going to be able to get any huge names like Troy Tulowitski or Felix Hernandez but there are some impact bats that could be had and some not so expensive moves that might make since to correct their issues. So lets look at the problems I listed before and a couple of possible solutions to them. a. Asdrubal Cabrerra– the Yankees have expressed interest in this talented shortstop. Most believe he is athletic enough to learn third base as well and would be under team control for next season so the Indians are not likely to give him away. b . The Rockies have expressed some interest in Phil Hughes and the Yankees aren’t going to give him away. Its obvious Troy isn’t on the block and Phil isn’t even close to being enough for Michael Cuddyer. But an interesting role player could be Jorden Pacheco. He hasn’t seen a lot of action this season but last season played in 132 games with 147 hits 54 RBI and a .309 BA In 21 games this season his BA is .286 He can play multiple positions mainly first and third, but came up as a catcher and has played second and left field. I haven’t heard the Yankees connected to him but maybe we can put a bug in their ear. 2. Mark Texeria is out for the season having season ending wrist surgery. Lyle Overbay has been decent but cannot hit lefties a lick and needs a platoon partner to become more effective. we already discussed Pacheco but what about more of a pure power hitter to try and get back some of those HRs we have lost with Tex on the shelf. The Only other first baseman the Rockies have is Helton but he’s a 39 year old lefty who at this point is not an upgrade over Lyle. One name that comes around every year about this time is Justin Morneeau. But he’s a Lefty and his power numbers are down so hes not really fitting the bill. The one that I want is Justin Smoak Hes a 26 year old switch hitter on a team that is going no place fast. Smoak is batting .272 in 68 games with 8 HR The Mariners have the luxury of having two first baseman the other is just as intriguing if not more so do to the fact that he has more power and would cost less do to the fact because of his pending free agency. Kendry Morales is batting .281 with 14 HR and 54 RBIs so either one of these guys would fix the problem. 3. Granderson will eventually be back and this will probably send someone packing. Unfortunately for Almonte it will probably be him. As a Rookie with options he can be sent down to Scranton till September call ups. Vernon Wells is not really tradable and makes to much money to just DFA. With no definite time table for Grandersons return there are some that believe that a right handed outfielder to Platoon with Ichiro is needed NOW. Names that are being tossed around include Michael Cuddyer (for a high price) , The Yankees don’t seem particularly interested but Marlon Byrd is having a hell of a season with 15 HR and 54 RBI at the break and wouldn’t be to expensive, My opinion is that the Yankees don’t need an outfielder unless his last name is Stanton, in which case plan on the Yankees having to empty the farm. 4. This one is a lock in my mind. Fransisco Cervelli isn’t coming back any time soon and may be facing a 50 game suspension for the Biogenisis scandal so the Yankees need to do better than the back up as the starter and Austin Romaine and his sub 200 BA and questionable defense as his backup. The Yankees have a Stud in the waiting down on the Farm in JR Murphy. Murphy was promoted this year from AA to AAA and has turned his questionable defense into his strongest asset. He’s currently batting 309 with 78 hits in 74 games 26 of them going for extra bases. Oh and he is also throwing out 45% of the base runners that try and steal on him. 4. Get Granderson Back healthy. add it all up = World series. Over the years I have repeatedly expressed my dislike for most things ESPN. Now to be fair I will admit to reading their site and watching the Channel. However when It comes to the site the Journalists are horrible. Not in their talent for writing, they are obviously professionals with years of literary experience and journalism degrees, but in their horribly bias opinions and their general lack of specific Yankees knowledge. Granted they have to cover so much that they cant be expected to know all things Yankees like you or I but certainly they should stop making news out of garbage. Specific examples you say? For one is their power rankings. Last week they have the A’s listed as number four. However last time I looked they are 20th in the league in Batting average. How does that work. Have you ever watched a game where the Red Sox are playing. Even if the Red Sox are on a 20 game losing streak and playing against Jesus and the Apostles the Sox swill be portrayed as if they are the ones that walk on water. One of them said the other day that the Yankees should be sellers at the deadline. ??? First of at a couple of games out of the wildcard lead why would you even think about being sellers and secondly just who do you think they are going to sell. All their assets are either pending free agency, to expensive to trade or on the DL. Or perhaps they want us to trade Nunez for a handful of magic beans. The Yankees certainly must be buyers and are a right handed bat and a right handed infielder that can hit away from making a run for the wildcard and possibly the division if they get on a role out of the gate in the second half. What really gets me is ESPN INSIDER??? You want me to pay how much a year to even read the articles that these bozos are writing? 26 dollars? How about I go to MLB.com or CBSsports and read the same content for free. Mlb.com is awesome, from their bloggers all the way up to the network analysts. Ok I don’t know if I gave you ten reasons or not but every once and a while I have to vent about them. I will give them credit for putting out a great magazine. The writers for ESPN Magazine are outstanding. They research their material and present it in a well thought out educated manner. The whole body issue thing was a bit much but it did shake things up a little and that was what it takes to get people to read your stuff. Some of my most read articles were about things that were controversial like Arod and steroids or about why you should hate ESPN. If you have to pay for something that you should get for free is it prostitution? Journalistic Hookers? Follow us on Twitter at Yankees magazine tonight we talk about trades. This is that time of year when you hear all kinds of trade rumors. Fact of the matter is most of it is just rumors and speculation. However usually there is a little bit of fact in their somewhere. This is a fact: The Yankees need offence! I don’t think any of you will disagree with that. There is one school of thought that just getting back some of these injured players can be better than any move the Yankees might make. So this seems like a great place to start, who is coming back and what do I expect from them in the second half. 1. Derek Jeter; Currently Derek is resting a grade one strain of his quadriceps. Did Jeter come back to soon? The world will never know. Based on history Jeter is a reliable bat and I believe he will hit close to .300 in the second half if he can stay healthy. He has been a rock for his entire career but he always plays full out. This is great if your 23, when you are 39 you need to take it easy. If Jeter is going to be effective he needs to have plenty of time at DH. Does this mean the Yankees should look to trade for a Short Stop? 2. Alex Rodriguez: I don’t even know what to tell you about this one. There are so many unknowns and If I were Brian Cashman I would seriously have a back-up plan. The General belief is that A-Rod will be facing a suspention of up to 150 games. Should this happen Im certain he will appeal which will allow him to play during this process. The bigger question is his health and effectiveness. He was 3-25 Rehabbing in single A ball, to me that is not all that encouraging. We will half to wait and see how the rest of his Rehab assignment goes. AA and AAA is next up for him and there isn’t much difference between the pitching there and in the majors. Should the Yankees Look to trade for a Third Baseman? 3. Mark Texeria: Out for the Season after wrist surgery. This leaves Lyle Overbay as your starting First baseman, at .252 BA with 11 Homers the Yankees have certainly gotten more than they expected from him. He is also a doubles machine hitting 18 of them so far this season. Although he is not Tex he has been ok with the glove as well with a .997 fielding percentage with only 2 errors.Will it be enough. do they need to find someone to play first bace on a regular basis? 4. Curtis Granderson: Granderson led the Yankees in HR last year with 43 that’s a lot of long balls that aren’t getting hit. Granderson is getting close to a rehab assignment. Next he will start hitting off a tee. I expect him back mid august but will that be to late? Do the Yankees need another Outfielder or are they ok with Gardner,Ichiro,Almonte,Wells combo? 5. Fransisco Cervelli: At one point it looked like he was close to coming back but after a setback im not so sure. Stewart who is his backup now starter has been great with the glove and although not Posada he has been better than replacement level with a .241 batting average. His back up Austin Romaine has been HORIBLE and I put that in capital only because there aren’t any larger letters. Do they need to find a Catcher? or do they have someone in the minors that will fit the bill. At this point Cervelli isn’t even throwing so don’t count on him. So lets hear it from you what do we need? give me your trade ideas in the comments and take the poll. Ill be back in a bit with my bold predictions on what would lead this team to the World Series. As many of you who are loyal readers know I often make my articles to long to make you want to read it right from the get go. So in an effort to engage more of you I have decided to break it up into a few sections. First lets talk about what went right in the first half, namely the pitching. 2. 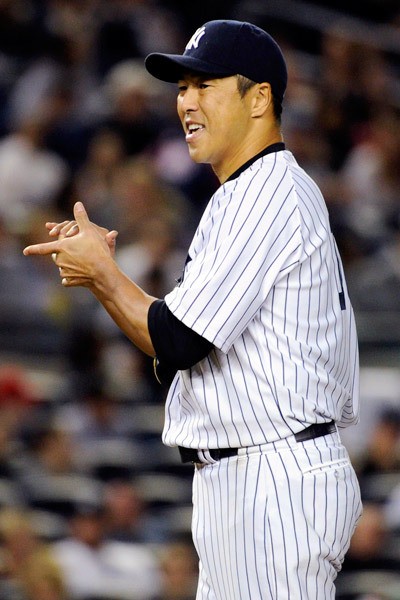 Hiroki Kuroda 8-6 2.85 era. If you break it down he has easily been the best starter to date. He is a victim of lack of run support. He should easily be 10-4 with a 2.00 era with a little more offence. we will talk about that in future report cards. 4. Phil Hughes. 4-9 with an ERA of 4.57 but don’t think that he is without value. He is only 27 years old and has a four+ quality pitches and can touch 95 mph with the fast ball. Phil has been a victim of the long ball. Yankees stadium does not now and never will favor the fly ball type pitcher. Hughes should be packing his bags as Its all but a given that he is being traded for some offence. Many feel that he is not a high value piece. He is a decent middle of the rotation guy who if not traded will almost certainly be given a qualifying offer and if he turns it down will net the Yankees a first round pick so the Yankees will not give him away. We will talk about trade possibilities in another piece this evening. 5. David Phelps 6-5 5.01 has pitched better than his era suggests. He has great control and excellent mechanics but his lack of velocity requires him to have great control. When he doesn’t he might as well be throwing batting practice. I like him as a middle reliever/spot starter over holding a long term spot in the rotation. 6. Ivan Nova 4-2 3.63 Having a reputation of not being the most consistent pitcher is tough. He should also have the reputation of having the best arm because he does. Nova as much as he makes you want to pull your hair out at times has GREAT STUFF!!! Right now he is On his game. Lately he has been a strike out machine. He has won his last two decisions pitching 17 innings and striking out 18 batters with an ERA of 1.89. Heres to hoping He can carry that over into the second half of the season. Seems that the Royals figured out that you can bunt against And because he is to old to cover the base in a hurry. He seemed to beat up on himself during the postgame for his inability to beat the runner to the base but that’s just Andy. He is his worst critic. In all fairness after the first couple of inning he settled down and pitched decently. He just needs to put runners away when he gets ahead. Four runs seems to be his new norm as that’s what he has given up in his last three starts. As luck would have it they have all been wins. It seems that he is getting a bit more run support than the rest of the rotation as it seems that Kuroda has gotten the short end of the run support stick of late. Jeter had a successful return to the Bronx, with a single an RBI and a run scored. That was until he was lifted for tightness in his quad. Hopefully its nothing and he will be back in the lineup Friday but they sent him for an MRI to error on the side of caution. Brett Gardner missed this game with a contusion after being struck by a pitch but I hear he will be playing on Friday against the Twins so its no big deal. Hafner however who also got a contusion after injuring himself in the batting cage might be out another day or so. (If we are lucky) Lyle Overbay continues to get timely hits with two more RBIs today. His July batting average is .273 with 2 HR and 6 RBI. Ichiro got another hit and scored another run. It amazes me that this guy is 39 years old and has 85 hits and a .278 BA right now. Would I be surprised if he hits 200 hits this year? Nope not at all. He like Rivera is an ageless wonder that will probably be playing at this same level three years from now. Its sad that the Yankees have won seven of their last ten but just cant seem to make up any ground in the east. Right after the all star break they have what might amount to three of the most important series of the year. The Red Sox , Rangers and Rays are all on the ticket and if the Yankees are to make a run at this these are the series they have to win. They are in a decent position right now sitting at only two and a half games behind the Rays and Rangers for the wild card lead. I’m not going to say the division is out of reach but they aren’t really within striking distance yet. If the Yankees can make a move for a right handed bat( preferably an infielder ) then I think they will make the playoffs. They need to be willing to give something up though if they are going to pick up anyone of any value. Joba And Hughes alone aren’t going to get it done as trade chips except for salary dump rentals. Hard to gauge the trade market but the names I keep hearing are Young and Morales. Ill let you know when I hear anything solid. All I can say is that they are trying to see if they can trade Hughes and/or Chamberlain and get back a bit more than a handful of magic beans. Was that HR by Overbay really needed? Don’t you think at that point they were just running up the score. Seriously though it was great to see the offence score with the long ball once again. Its the way of the bombers and its what we have all come to expect. 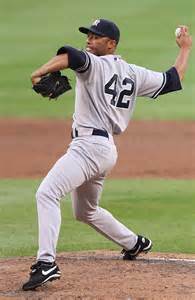 We cant let our love for the long ball to overshadow tonight’s true star and that was Ivan Nova. Where did this guy come from? It seems almost overnight he has turned from the guy who leaves big cookies in the middle of the plate to the guy who has great control down in the zone making him a strike out machine. In his last two starts Nova has thrown 17 innings giving up 3 earned runs on 8 hits and has struck out 17 batters. To simply say he was sharp tonight (which is what espn gave him credit for) is an understatement. He was brilliant. This may sound rotten but Hafner getting hurt and being replaced by Wells was a blessing. Lately Hafner has not been able to hit a barn door with a machine gun and Wells has shown some signs of life. Wells went 2-2 tonight with a run scored and in the last seven days he is 6-15 which translates to a .400 BA. Hafner on the other hand 5-25 which equals a .200BA. Hafner is our DH and for those of you who dont understand what the DH is supposed to do its Hit. Thats it! Just get hits and drive in runs. Hafner has not done that since May. His BA is down to .214 and is batting .185 in July. I heard a rumor that Help is on the way. Im assuming this means Derek Jeter however it appears he will still be in Scrantons line-up tomorrow. Today he went 0-3 with an Error but said that he felt good. I surmise that If he feels good after back to back games you may see him play this weekend against the Twins. Lets be honest is playing against the Twins any different than playing in a minor league rehab game anyhow? Reports that A-Rod will be suspended are a bit premature as MLB investigators haven’t even spoken to him yet. The Fact that Ryan Braun isn’t cooperating implies that he is probably guilty but it is still difficult to suspend someone without actual proof. Investigators will speak to A-Rod on Friday and at some point they will make a ruling on whether or not some 20 players will be suspended. The evidence against them seems to hinge primarily on the testimony of Tony Bosch who was the administrator of biogenisis ,an organization that allegedly gave steroids and other banned substances to players who are on this list, and some hand written notes that implicate them. I believe that A-Rod will declare his innocence regardless of whether he is guilty or not. The league will probably try and slap him with a 100 game suspension and possibly 50 games for fellow teammate Fransisco Cervelli. A-Rod will of course appeal this suspension and will probably end up playing the rest of the regular season before his appeal is even heard. At which point I believe the players union will negotiate a lighter sentence and he will end up serving 50 games next season. This of course is all speculation on my part. There is also a belief that A-Rod may try and avoid all the hoopla using the inability to recover from his latest surgery as means to retire thru the physically unable to perform loophole This would allow him to collect the money owed to him via a large insurance policy taken out on his contract. This would also allow him to avoid the public humiliation of yet again being found guilty of steroids and would save the Yankees a boat load of money over the next few years. Could happen but it seems unlikely as many would view this as him just trying to dodge the rules and get paid. Then of course there is another possibility that he is innocent of all charges that have been proposed against him and that he will be cleared and Major Leauge Baseball will issue an apology for all the grief they have caused him over the duration of this investigation. However it seems more likely that they will decide to make the baseball square. Offensive is the best word to describe how bad the Yankees have been hitting, Awful is just not strong enough anymore. When you can only manage 1 run against the Royals with your Ace CC Sabathia on the mound you need to do something to create some offence fast. Lets break it down to the good the bad and the ugly. Not much has been good about the Yankees offence but you have to give credit to someone so of course it starts with Robinson Cano, who will be starting at second base during the All star game and is batting .294 with 20 HR and 59 RBI’s . He will demand a kings ransom when he hits free agency this year and deserves it. However the Yanks need to be careful not to give him a ridiculous contract like the one they gave A-Rod that they will be regretting later in his career. I think seven years and 180 million is what he is worth. with a vesting option for an eighth year that could take it to 200 million if he remains healthy. I am a big believer in incentives for MVP awards and gold gloves and the like that could make the total contract well over 200 million. I don’t mind them paying more money for less years but I don’t want to see them get stuck with a 40 year old broken down guy. We could go on an on about Cano but in the spirit of brevity lets move on. Brett Gardner is having a decent year at the plate and in the field, batting .272 with 7 HR (a career high) and continues to hold runners put with his strong arm. However he is striking out way to much with 80 strike outs in 340 AB (he is leading the league in this department) Also for some reason he is not stealing bases nearly as often as he needs to. He has 11 and has been caught 6 times, this is about half of what he should have in order to keep pace with his 2011 season total. Also proving that he was money well spent has been Ichiro who is batting .278 and has 5 HR and has 12 stolen bases. Ichiro is not known as a power hitter and his career best in HR is 15. That personal record is probably not in jeopardy but for a half season at 38 years old they are good numbers.Rounding out the Yankees success stories for this season so far is Rookie Zolio Almonte who had a great spring and could turn out to be a special player for the future. He is only 24 years old and in 20 games is batting .284 and has 19 hits and 3 stolen bases and 4 doubles. It seems like the kid gets a hit almost every day and shows no fear at the plate as well as being a decent defender. That is all you can say good about the Yankees offence. Luis Cruz is batting .147 and Alberto Gonzalez .204 Eduardo Nunez has just returned from the DL and is definitely an upgrade over the two of them and is batting .375 since his return . Chris Stewart is batting .255 but has been good defensively . Austin Romaine his back up has been horrible and will most likely be gone before I am done typing this. Worse news arrives today as it looks like Arod may face a 100 game suspension and Cervelli a 50 game suspension for their roles in the latest steroid scandal. So Whats next? First know that help is on the way. It seems that Jeter is ready to go (at least in his eyes) and may return to the bombers as soon as the Twins series but more likely the Red Sox series. Look for him to be an immediate boost to the line up and his presence and his leadership will make everyone better. You can take that one to the bank. This however wont be nearly enough to push them over the hump. At 2.5 games out of the Wild card and 5 out of the division the Yankees are definitely not out of it yet. Especially with series against the Red Sox,Rangers and Rays coming after the All Star break this will be their opportunity to make or break the season. Eventually Granderson will be returning as well and may help bolster the line up for the stretch run but by that time it will all but be decided if the Yankees have a shot. Right now they need to upgrade at Catcher, First base and Third base in order to have a shot. The need will be a right handed batter that must be an upgrade over what they have now. First Base Options; External Michael Young, Justin Mouneau, Carlos Pena, Justin Smoak or Jesus Guzman are possible trade candidates. I personally am leaning toward Michael Young who should be available on the cheap and can play first or third. He is a right handed bat that is currently hitting .289. Also the Phillies have shown some interest in Joba Chamberlain. I have also heard Ty Wiggintons name tossed around a bit as he is a free agent and the Yankees have expressed interest in him in the past. Internal options: The Yankees have Dan Johnson down in Scranton who is currently batting .251 with 12 Homers and 44 RBI. Unfortunately he is a lefty and really doesn’t provide an upgrade offensively over Overbay and is certainly going the wrong way defensively. Also down at Trenton is Andrew Clark who is batting .308 but is not currently on the 40 man roster and is not considered ready for major league pitching. Catching options external: Carlos Ruiz of the Phillies would be an upgrade over what they have now but not much over Stewart. Of course anyone is better than Romaine at this point. Also Ramon Hernandez is a free agent but I don’t think the Yankees have much interest. Other possibilities for trade could include Brian McCann if the Braves feel that they wont be able to retain him next year. An Internal candidate seems the most likely move which would be calling up JR Murphy. He has been tearing it up in the minors with his .307 batting average and is throwing out 43 percent of the runners who are attempting to steal on him. Seems like just picking up Young and calling up Murphy would allow you to bat Hafner/Wells in the eight spot where they belong instead of fourth or fifth. Or do you think that the Yankees should be sellers???? Click here For Live sports feeds.